Arthritis is a condition that has affected humans since the beginning of time. Before the advent of modern pharmaceuticals, those who were afflicted did not simply suffer endlessly from pain, but utilized nature’s herbs and organic foods to help minimize the associated pain. "Arthritis" comes from the Greek word arthron, which means joint and the Lain word itis, which mean inflammation. Therefore, arthritis means “inflammation of the joint”. In general, there are two main types of arthritis. The first is osteoarthritis (~95%) and the second is rheumatoid arthritis (~5%). Osteoarthritis usually results from general “wear and tear” of the joints. It results from the destruction of cartilage, which acts as a cushion that covers the bone. Early signs of osteoarthritis may begin when an individual is around 40 years old and can progress as one ages. The joints can be tender but are rarely swollen. Joint trauma, at any age, can also lead to osteoarthritis in the affected joint. When my son Joshua was in the sixth grade, he broke his elbow playing basketball. He underwent surgery to have a pin placed so the bone could be put back in place. At age 19, he had a mild form of arthritis in his elbow joint. The pain and stiffness are worse during the cold weather, and his elbow aches and locks up sometimes. Unfortunately, he may have to deal with this for life. However, he does notice improvement when he eats healthier and when he takes fish oil supplements or cod liver oil. Osteoarthritis is the primary type of arthritis for which senior citizens visit their doctors. 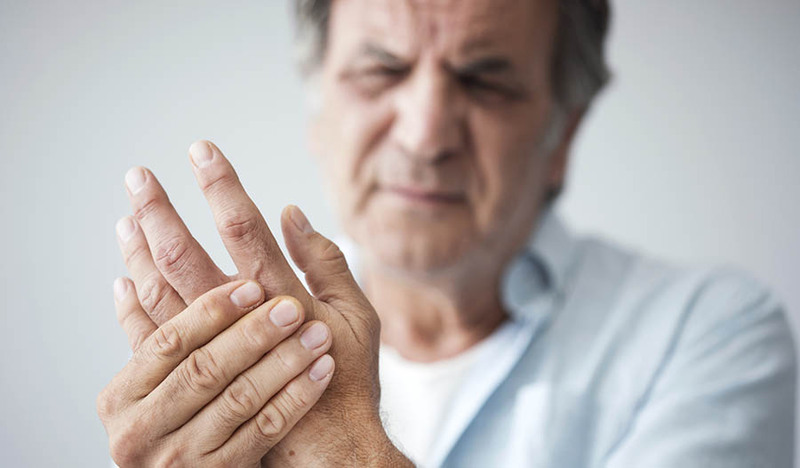 Rheumatoid arthritis is the result of an autoimmune condition in which one’s immune system attacks the lining of the joints. This results in the destruction of the cartilage and can occur at any age. There is even a form called Juvenile Rheumatoid Arthritis (JRA), which can affect children. It begins over the course of a few weeks or months with morning stiffness usually persisting for more than an hour. Many patients will have associated intestinal issues and, overall, may feel fatigued and unwell. Studies show that up to 60 percent of those diagnosed with rheumatoid arthritis have tried Complementary or Alternative Medicine in an attempt to treat their condition. Regardless of the type of arthritis a person has, the result can be trouble getting around on a daily basis. Arthritis can cause significant disability for the person afflicted. I first learned about the use of diet in reducing symptoms of rheumatoid arthritis when I was in medical school. When I was a third-year medical student at the Ohio State University School of Medicine, I had a patient who was admitted to the hospital for pneumonia. Unfortunately, he also had severe rheumatoid arthritis. He asked if I could get him a can of pineapple chunks. I considered this a strange request and asked him why he wanted this particular food. He told me that a few years prior, he had been diagnosed with rheumatoid arthritis and was taking NSAIDs and methotrexate for his condition. However, he stated that those medications did not provide much relief. He went on to explain that a can of pineapple chunks when taken daily, did more to reduce his pain than any prescription medication. A quick trip to the medical library and some research taught me that pineapples are rich in bromelain, a natural anti-inflammatory. If eating a can of pineapples each day is not desired, fortunately, there is a supplement that can be taken instead. Acetaminophen (Tylenol, Paracetamol) – While helpful for some, these medications when taken for prolonged periods of time can put extra stress on the liver and lower glutathione levels. NSAIDs (Non-steroidal Anti-inflammatory Drugs) - Ibuprofen (Motrin, Advil), Naproxen (Aleve, Naprosyn), Diclofenac, Indomethacin, and Celecoxib (Celebrex) are helpful in the short-term. However, these medications increase the risk of kidney disease, heart attacks and strokes according to the Federal Drug Administration (FDA), who oversees pharmaceutical drug safety in the United States. Topical pain medications – These may be “safer” medications. Applied topically, they go directly to the area affected. These include over the counter medications such as Aspercreme, capsaicin or low dose lidocaine. In many countries, a prescription is needed for topical diclofenac, ketoprofen, high-dose lidocaine and ketamine. Narcotics (codeine, tramadol, hydrocodone, morphine, oxycodone) - Derived from the opium poppy. Overuse of narcotics is an epidemic in the U.S., where up to 30,000 people die each year from these medications. When used appropriately for short term, they can be helpful but are highly addictive. Long-term use may actually increase pain and increase risk for a person to stop breathing. Joint injections using corticosteroids or hyaluronic acid (Synvisc), a substance that comes from chicken combs – The cost of the corticosteroid shot is less than $200 while the hyaluronic acid injections require 3 shots and cost up to USD $1,300. The benefit is short-lived, usually a few months. NSAIDs (Non-Steroidal Anti-inflammatory Drugs) – See above. Side effects include kidney disease, heart attacks, strokes and bleeding stomach ulcers. Biologics or immune modulators may be used. These drugs increase the risk for cancer and life-threatening infections. Consuming a primarily plant-based diet is the best for reducing chronic inflammation and pain in the joints. Studies demonstrated that the Mediterranean diet can be helpful in reducing joint inflammation. A study in the Lancet showed when patients went on a vegan, gluten-free diet for three to five months and then switched to a lactovegetarian diet significantly reduced joint pain for up to 1 year. Limiting animal-based products such as beef and chicken helps reduce pain. Avoid sugars, trans-fats (hydrogenated oils), arachidonic acid (found in meats and eggs, consume rarely), which cause more inflammation and therefore more pain in your joints. Reach your optimal weight, which is a BMI < 25. Carrying excess weight places more stress on your joints. Extra weight also increases inflammatory proteins (cytokines) in your blood resulting in more pain. Fruits, vegetables and whole grains contain phytonutrients, which decrease inflammation and therefore pain. Aim for 5-9 servings per day. Some people are sensitive to a class of foods called nightshades. When you eat these, joint pain may worsen. These include potatoes, tomatoes, eggplant and tobacco. People with food sensitivities may have increased joint pain with dairy, wheat (gluten sensitivity) and nightshade vegetables (tobacco, tomato, white potato, bell pepper). Do a two-week elimination diet to see if these foods are associated with your joint pain. Tai Chi has been shown to be helpful in alleviating knee pain among other issues. Yoga has been shown to lessen joint pain in those with Rheumatoid and Osteoarthritis. Curcumin/Turmeric - Studies show this herb to be helpful in reducing pain for both rheumatoid and osteoarthritis. Scientists have discovered that this herb does things similar to multiple blockbuster prescription drugs since it modifies NF-κB signaling and reduces pro-inflammatory chemicals such as COX-2 and 5-LOX. Omega 3 Fish Oil (EPA/DHA) - 500 mg (a minimum of 500 mg per day up to 2,000 mg per day). Studies show essential fatty acids help improve pain and reduce the use of NSAID. Studies also show a reduction of joint stiffness when fish oil is taken daily. Nigella Sativa (Black cumin seed oil) - A medicinal herb was shown to reduce inflammation in both rheumatoid arthritis and osteoarthritis It does so by inhibiting inflammatory chemicals called interleukin-1, 6 and nuclear factor κB. Boswellia - At 50 mg minimum per day, this Ayurvedic herbal supplement can help and reduce pain and inflammation markers, like CRP in rheumatoid, and reduce pain osteoarthritis. Ginger - At 25 mg minimum per day, ginger can help reduce inflammatory markers and pain in osteoarthritis. Ginger is a COX inhibitor, meaning it works similar to ibuprofen and naproxen to reduce pain and inflammation. The above supplements can be taken separately or taken in a combination nutraceutical supplement. SAM-e is also effective in lowering pain associated with arthritis. Take 400 mg 2-3 times per day. White Willow Bark is used by Native Americans for fever and pain. Take as directed on the label. Contains salicin, the compound aspirin comes from. Do not take this herb if you take aspirin or NSAIDs drugs. Vitamin D – 5,000 IU daily. Studies show that those with higher levels of vitamin D are less likely to develop rheumatoid arthritis, and routine consumption also reduces pain. Probiotics, specifically lactobacilli, may help reduce symptoms of rheumatoid arthritis. Gonzalez Cernadas L, Rodríguez-Romero B, Carballo-Costa L. Importance of nutritional treatment in the inflammatory process of rheumatoid arthritis patients; a review. Nutr Hosp. 2014;29:237–45. Kjeldsen-Kragh J, Haugen M, Borchgrevink CF, Laerum E, Eek M, Mowinkel P, et al. Controlled trial of fasting and one-year vegetarian diet in rheumatoid arthritis. Lancet. 1991;338:899–902. Wang C, Schmid CH, Hibberd PL, et al. Tai Chi is Effective in Treating Knee Osteoarthritis: A Randomized Controlled Trial. Arthritis and rheumatism. 2009;61(11):1545-1553. doi:10.1002/art.24832. J Med Food. 2016 Aug 1; 19(8): 717–729. Arch Med Res. 2012 Jul;43(5):356-62. doi: 10.1016/j.arcmed.2012.06.011. Epub 2012 Jul 24. Avicenna J Phytomed. 2016 Jan-Feb;6(1):34-43. Inflammation. 2015 Dec;38(6):2235-41. doi: 10.1007/s10753-015-0206-1. Ahmad A, Husain A, Mujeeb M, et al. A review on therapeutic potential of Nigella sativa: A miracle herb. Asian Pacific Journal of Tropical Biomedicine. 2013;3(5):337-352. doi:10.1016/S2221-1691(13)60075-1. Phytomedicine. 2010 Sep;17(11):862-7. doi: 10.1016/j.phymed.2010.03.003. Epub 2010 Aug 8. Osteoarthritis Cartilage. 2015 Jan;23(1):13-21. doi: 10.1016/j.joca.2014.09.024. Epub 2014 Oct 7. Cochrane Database Syst Rev. 2015 Jan 28;1:CD005614. doi: 10.1002/14651858.CD005614.pub2.